Do you need a new roof for your home this season? Are you tired of the same old asphalt shingle roofs that look like every other roof on the block? Do you want something with distinctive, rustic, country-estate flair? Perhaps it’s time to consider a cedar shake roof. Dominion Roofing Co. has been installing cedar shake roofing throughout the Maryland area for more than 25 years. Choose from a number of cedar shake colors, styles, and configurations. Whether you need cedar shake roofing installation, repair, or maintenance, count on Dominion Roofing Co. to provide you with unparalleled service and experience at a great price. Contact us today to schedule an estimate for cedar shake roofing installation, repair, or maintenance! Simply fill out the contact form on the right or give us a call to get started. A cedar shake roof is made of individual wooden, rectangular shingles that are attached in layers over a watertight under-layer. New cedar has a rich honey-brown tone that turns a golden ash color as it ages. Aesthetics – A cedar shake roof can transform the exterior of your home and give it a one-of-a-kind country estate look. Cedar roofs go with most architecture styles, from cottage to traditional. In addition, cedar shake roofing is very durable and a properly installed roof can last up to 50 or 60 years, sometimes longer. 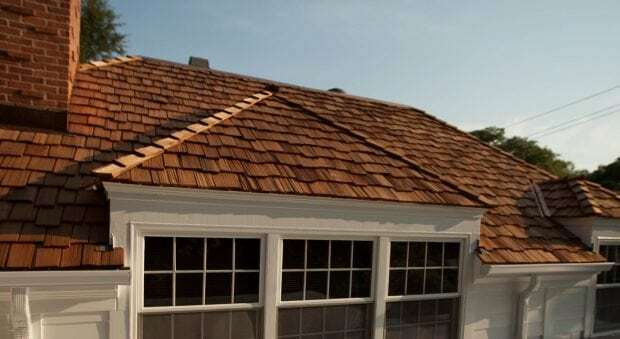 Longevity – Your new cedar shake roof may be the last roof you’ll ever have to put on your house. 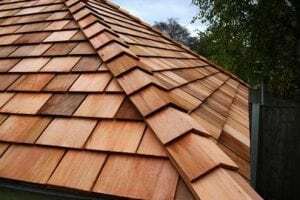 Even if you don’t intend to stay in your home for 50 years, installing a cedar roof can help boost your property value, as the prospective buyers will realize they won’t have to replace the roof anytime soon. Durability – Unlike many other types of wood, cedar is insect-resistant, so you don’t have to worry about your new roof inviting a swarm of pests to your home. 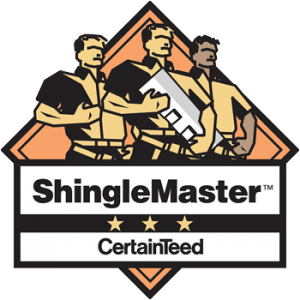 Cedar shake also stands up to hail and storm damage, something that can wreak havoc with an asphalt roof and something Maryland homeowners are all too familiar with. Some insurance companies even offer a discount on homeowner’s policies for homes with cedar shake roofs. Energy Efficiency – Cedar also makes a good insulator for your home and the naturally soft color doesn’t absorb the summer heat like an asphalt roof does. As lovely and as durable as a cedar shake roof is, such a roof is not right for every home or every homeowner. For one thing, a cedar roof is quite a bit more expensive than an asphalt shingle roof. If you’d like to explore the possibility of adding beautiful cedar shake roofing to your Maryland home, call Dominion Roofing Co. at (301) 942-2009. We’ve been helping area home and business owners with their roofing needs for more than 25 years!